Quite surprised to find no articles tagged with the keywords Yassa and especially Chingis Khan — and only one relevant article on Illuminaiton Philosophy. Sadly, according to searches in Teilkatalog Zeitschriften und Serien des Österreichischen Bibliothekenverbunds and Elektronischen Zeitschriftenbibliothek the most interesting result (Divine Illumination, Mechanical Calculators, and the Roots of Modern Reason. Detail Only AvailableBy: Dear, Peter. Science in Context. Sep2010, Vol. 23 Issue 3, p351-366) is apparently not available in Vienna. The OBV results based on searches for the above key words proved useful and led me to some literature I had not encountered before, in addition to the more common works which I had expected to find. This includes Muḥammad ʿAbd-al-Ġanī’s books on the history of Persian language and literature at the Mughal court, Richard Eaton’s book on India’s Islamic traditions and R. Nath’s book on Mughal sculpture. I was also thrilled to find that Raizul Islam’s book on Indo-Persian relations is available at the OAW. The results were both accurate and manageable in number, so I’ll be using the OBV catalogue more often in the future. The Encyclopedia Britannica contains an extensive series of articles on the significance of the Mughal Empire, though the accompanying bibliography has not been updated in recent years. It includes overview articles on the establishment of the empire as well as subsequent reigns of individual emperors, highlighting a variety of political, cultural and religious topics. A more up-to-date reference, though more limited in scope, is the Encyclopaedia Iranica, which includes numerous articles on Iranian culture on the Indian Subcontinent, including on Mughal architecture, Indo-Persian historiography, and important personalities from the empire, such as individual emperors, men of letters and religious personalities. Among more specialized reference works, the most comprehensive series dealing with ‘modern’ Indian history in the English language is The New Cambridge History of India. Of the 23 volumes it contains, three are dedicated specifically to the Mughals: Vol. 1.3. (Mughal and Rajput Painting by Milo Cleveland Beach), Vol. 1.4. (Mughal Architecture by Catherine Asher) and Vol. 1.5. (The Mughal Empire by John F. Richards). These volumes provide a good introduction into the respective areas. Vol. 1.5. offers an overview of the empire generally, as well as a bibliographical guide for further reading, organized according to individual topics. As an overview, the abovementioned Vol. 1.4. on Architecture was preceded by another volume that remains a definitive reference for Mughal architecture, namely Ebba Koch’s Mughal Architecture: An Outline of its History and Development (1526–1858). Vol. 1.5. was followed by Annemarie Schimmel’s overview The Empire of the Great Mughals – History, Art and Culture. An Indian analogue to ‘Western’ scholarship on Mughal architecture can be found in R. Nath’s History of Mughal Architecture in four volumes. My interest in the title and subject of this blog took an irreversible turn when I first strolled around the serene gardens of the Red Fort in Delhi, built as imperial residence by Mughal emperor Shah Jahan (r.1627-1658), the builder also of the famous Taj Mahal, in the first half of the seventeenth century. 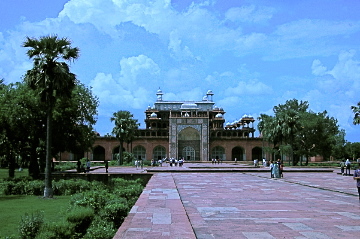 For Shah Jahan, who by this time had developed a strict formal architectural style emphasizing natural symmetry and vegetalized ornamentation, this meant building a palace whose baluster columns evoked cypresses, whose walls were adorned with naturalistic renderings of plants in marble relief, and blossoming pietra dura flowers of precious stones, replete with streams cascading through pavilions — an immortal paradisiacal garden of stone to mirror the passing beauty of its natural equivalent. The famous Koranic inscription I read above one of the portals in the garden, “If there is paradise on earth, it is here, it is here, it is here!” has held me ever since. These days I am in the early stages of writing a thesis about one of the Mughals’ most enigmatic architectural masterpieces, the tomb of Mughal emperor Akbar (r.1556-1605), who by his conquests and institutional innovations transformed a modest, insecure north Indian state he inherited from his father, to bequeath to his successors a stable, populous empire, whose wealth dwarfed that of his European, Ottoman and Persian contemporaries, and cemented the rule of this Turko-Mongol dynasty on the Indian subcontinent until the eighteenth century. This blog is intended to deal with the Mughal dynasty more widely, including not only its art and architecture, but its history in the broadest sense. The items that will particularly interest me are those related to Mughal imperial ideology and its role in architectural programs, especially those of their magnificent dynastic tombs. What precisely did the ideology consist of, what was its development, and how (and why) was it translated into architectural monuments of such enduring appeal? I’ve found blogs can serve as useful aggregates of references to relevant information published elsewhere, at times accompanied by commentary. It is easy to see how this could be of use among historians interested in unknown propositions akin or opposed to their own. 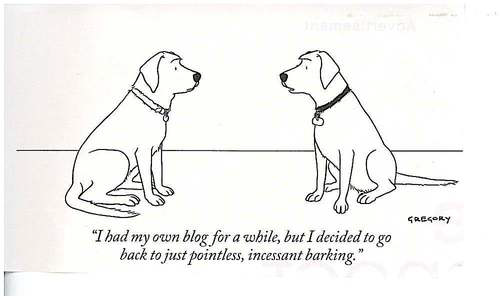 But for a blog to be of any value, its editor should produce a selection of content that is intelligent and reliable. This is easier said than done; and it is not surprising that, statistically speaking, nearly every blog out there remains virtually unread. Fortunately, a few do overcome the odds, and are a source of joy to some. It is perhaps unfortunate that of the most interesting historians alive today, only very few, indeed none in my field of interest, have taken it upon themselves to provide the rest of us the benefit of sharing in their daily stream of ideas, and engage those outside their immediate intellectual circle in discussion. The great historians of our age — “shamed,” as Eric Hobsbawm would say “into the computer-era” — for better or worse are not bloggers. It is easily said that the incentive is simply not with those already connected by conventional channels of communication to all the interlocutors they could possibly wish for. Whereas that may not apply to the news media, where blogs have come to feed a demand-driven news-cycle, it certainly does to the slower clocks of academia, where ‘ideas’, for the moment at least, have not devolved into a popularity contest — or so we tell ourselves.